The Peak Performance Formula naturally and organically flushes toxins from the body while supporting the immune system. 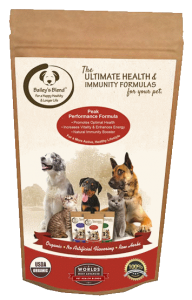 When it comes to the finest targeted and synergistic blend for a healthy dog, the Peak Performance Formula is the best blend. Bailey’s Blend Intensive Care Formula helps your pet fight Cancer, Cushing’s Disease, and Obesity. This Bailey’s Blend exclusive proprietary formula heals and prevents debilitation degenerative diseases. The product is 100% organic raw herbs. We’ve been receiving all sorts of letters and emails from our Bailey’s Blend family of pet parents asking us how we could help their dogs’ mobility and how we might help ease their stiffness and joint pain.